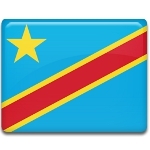 On May 17 each year, the Democratic Republic of the Congo (DR Congo) celebrates Liberation Day. It is a public holiday that commemorates the 1997 coup d'etat led by Laurent-Désiré Kabila. In 1960, the Belgian Congo achieved its independence as the Republic of Congo (the country's present name was adopted later). The proclamation of the independence was immediately followed by a political crisis which ended when Joseph-Desiré Mobutu seized power in 1965. Mobutu's rule lasted for more than three decades. He established a centralized single-party state and eventually became the object of a powerful cult of personality. Mobutu's dictatorship ended in 1997, following the First Congo War. The war was initiated by the rebel leader Laurent-Désiré Kabila who enlisted the support from Rwanda, Uganda, and Burundi. He started a full-scale rebellion and eventually overthrew Mobutu. On May 16, 1997, Mobutu fled into exile. The next day, Kabila proclaimed himself President. National Liberation Day in DR Congo is a non-working holiday, so all government offices and most businesses are closed for the day. The holiday is marked with public speeches, colorful street parades, and cultural shows.